The Florida Keys is a must visit for anyone who loves the outdoors and is looking to explore a Florida gem. One of our favorite locations in the Keys is Islamorada. This beautiful location is great for snorkeling, kayaking, paddleboarding, fishing or just relaxing on the water. The Florida keys do have some amazing sunsets over the gulf side and you can find fresh seafood anywhere you stop. What I have learned from my experience is don’t try to do everything in one trip. Being out on the water and in the sun is fun but it is also draining so just plan one activity and enjoy your day. Islamorada is about 2-hour drive from Fort Lauderdale. I would suggest leaving at 6am if you plan on spending your day in the Keys and the later you leave the more traffic you will encounter. A large majority of the drive is only one to two lanes and can back up very easily, this seems to be a great time and you get to watch the sunrise over the Atlantic ocean. My second suggestion is to check the weather forecast and then the marine forecast. Ideally, you’re looking for the marine forecast to show smooth waters 2-3 feet is not bad any more than that I normally rescheduled my trip. This is only my personal experience I am sure other people have enjoyed the day with higher waves I just like it when the water is flat and calm. The clear waters are ideal for Kayaking and SUP there is also plenty to see if you’re interested in paddling thru the mangroves. Parking at Robbie’s is a great option if you have your own gear or plan on renting from the kayak shack. The rental price for Kayaks and SUP is reasonable. To contact the kayak shack for current prices (305) 664-4878 | floridakeyskayakandjetski@gmail.com . If you have your own gear drop in towards the end of the boat duck. The mangrove trail entrance is west a map is included below. The last visit I did see a big family of manatee going into this trail remembers it is Illegal to touch, feed or harass the manatees. The mangrove trails around Robbies also has a few resident crocodiles that like to hang around the docks. Don’t be alarmed if they say HELLO. Another cool option for kayaking and SUP is Indian Key State Park. The island is located about 2 miles from Robbie’s boat dock. I would highly suggest bringing water shoes for all your adventures, your feet will appreciate it. When paddling to the island during low tide the sandbar is exposed and a good chance of getting stuck is possible so be aware of the tides. The island is easy to access with kayak or SUP just remember to pull your gear up so that the tide does not take your only way out off the Island. I would suggest bringing your snorkel and dive flag, there is some coral on the east side of the island be aware there is some fire coral in the area. The waters are crystal clear and fishing is a local culture here. If you’re interested in fishing I do suggest Robbies they have few options available with some great staff. I know I talk about Robbie’s a lot and I am sure other places are just as great but personally, I have used them and always had a great time. My favorite option is doing the morning party boat “tip ask for the rear of the boat and book in advance”. The staff has always been wonderful and everything is provided bait and also help for beginners. The boat crew would also filet your catch once your back and if you interested in having lunch or dinner at the restaurant they would cook your catch for a reasonable price and includes side dishes. If you’re renting a boat there are a few really nice reefs only a short distance away. The first one is Alligator reef located a few miles from Robbies. The reef usually has clear water and lots of great snorkeling. Early in the morning sea turtles are commonly found here feeding on the grass and cruising through the grassbeds. The second suggestion would be Cheeca Rocks located a little north and is 2 miles from shore right across from Guy Harvey Resort. This location has bouys located inside the protected area that your boat ties off to. If your doing the boat rental hopefully you brought your fishing or snorkeling gear also be aware of the tides times and the sandbars in the area. When exiting Robbies pay attention because Manatee are in the area. There are plenty of stops for breakfast once you get into the Keys past Florida City. If you plan on fishing, Ricks Yellow Bait shop in homestead offers live bait and gear. There are plenty of other places in the keys that offer bait and snorkeling gear once you’re here. If you plan on snorkeling more than one time it is cheaper to buy your own gear. Many outdoor shops offer reasonably priced kits that will be all you need. 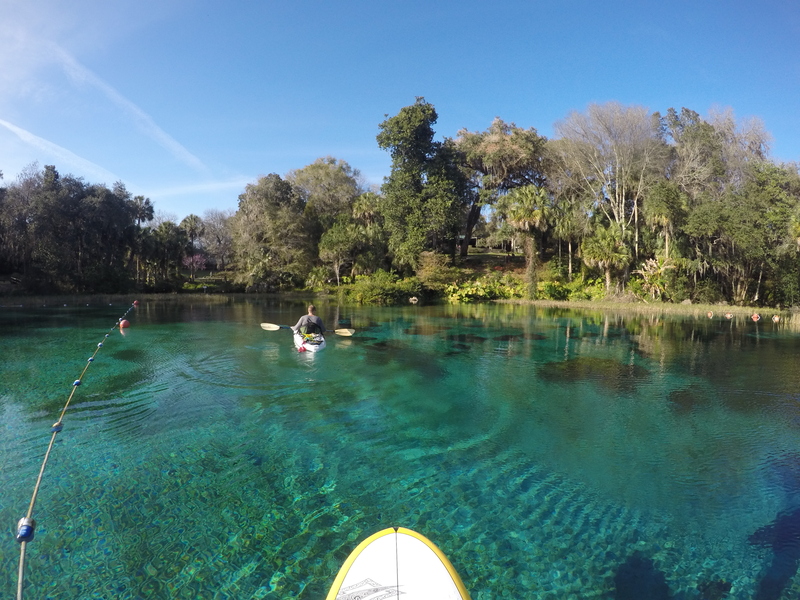 Rainbow River is really amazing and probably one of my favorite springs in Florida. It is located 2 hrs from Orlando in Dunnellon. My best suggestion is to park at KY hole and paddle upstream to Rainbow River State Park. The State Park has parking for kayaks and paddle boards near the canoe lunch site that’s on your left. Bring a few dollars with you for the park entrance fee, They also have a gift shop. If you did not bring your own kayak KP Hole has kayak and SUP rentals. Phil Foster is located in Riviera Beach, It’s a one hour drive from Fort Lauderdale. The Park is open 7 days a week and offers free limited parking. This is a really cool dive location but a few notes should be taken. The best snorkeling time is 1 to 2 hours before High tide. A dive flag is required for this snorkeling adventure or else you may get a ticket. The parking is limited at this location so plan to arrive early.